I was nominated for a Nice Matters Award form Adrienne , Cathy and Cynthia and I appreciate it very much. Nice really does matter and that was so nice of each of them to think of me. I was also tagged for the 7 wonders meme that's going around but I'm going to skip that one because it would be really hard to single out just 7 people. 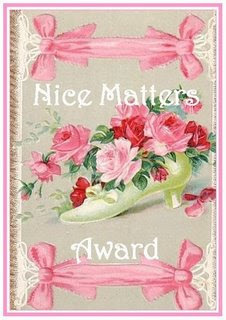 I'm going to pass this Nice Matters Award to whoever has ever left a comment on my blog and who would like to do it. 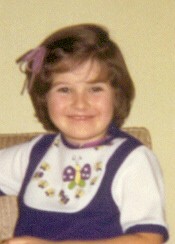 Hope you're having a blast of a weekend! Congrats Cindy! I also tagged you on my blog as one of my favorite bloggers and I was just stopping by to tell you. Thanks for all the inspiratin you provide to all of us! Congratulations Cindy on your Nice Matters Award... Enjoy. Congratulations Cindy, it's well deserved (you are nice)! A well deserved award to a wonderful person! I have to agree! You share everything~ And are very nice! You deserve it Cindy! You make all of OUR days that much brighter. Who can live without your blog? No one I know!